Another holiday weekend has arrived. Memorial Day weekend last, I drove through six national parks on the way from LA to Chicago with one of my best friends. This weekend? I’ll be marathoning… a Homeland marathon, a Sherlock Marathon and a Downton Abbey marathon. It’s couch potato city with what I am told are the three best TV shows currently available. I’ll keep you posted on the Facebook page. I imagine many of you will be a little more active. Whatever the case, as with Memorial Day, I wanted to give you food and film and also some books to help you enjoy your weekend. I’ve written once already about Suzanne Goin, an amazing chef and restaurateur who has created some of my favorite dishes in the world. The recipe below might be my top of the tops. No holiday weekend is complete without grilling and what could be better to grill but burgers? What also could be better than pork? Goin’s pork burgers are the best burgers I have ever had, bar none. And I’ve had, oh, one or two. These burgers take a little prep and work but trust me, the end result is worth a little extra effort. 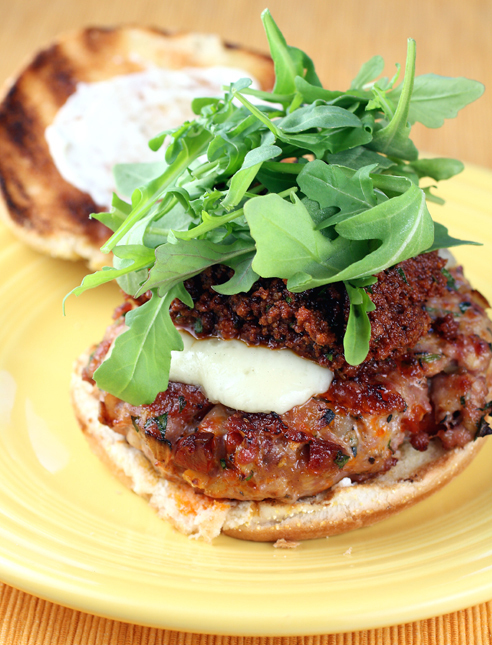 As Food Gal writes, (thank you to Food Gal for this link to the recipe) Goin’s pork burgers are “Heaven on A Bun”. Click here for the recipe and the remaining choices!